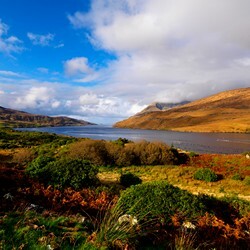 A remarkable county with a truly unique atmosphere, Galway in the West of Ireland gets under your skin like no other place in the world. Dramatic, haunting and utterly wild, the craggy countryside at times looks unforgiving, at times rich with bursts of colour and dotted with tranquil, picture perfect lakes. The Gaeltacht area of County Galway offers an authentic insight into life through the Irish language, and the Aran Islands have a breathtaking beauty and an island atmosphere of their own. On top of all this, Galway’s got great beaches, soaring mountains, lovely villages, fabulous pubs and some of the friendliest people in Ireland. The nearest major airport is Shannon Airport, in Co Clare. The main ports of entry are Cork, Dublin and Rosslare - all of which are betwen 3 and 4 hours drive from Galway. Visit Irish Ferries for more information. The Dublin / Galway line serves Co. Galway with stations at Ballinasloe, Woodlawn, Attymon, Athenry and Galway City.